AL Pictures Slideshow Studio can create a slideshow of picture and audio files. Slideshows can be created as an executable (.EXE) file or as a screensaver (.SCR) file. It has 182 transitional effects to help in creating a more interesting show. To playback created the slideshow, no additional programs are required. To create slideshows, pictures JPG,JPEG,TGA,TIF and BMP formats and audio files MP3, WAV and MIDI formats can be used. 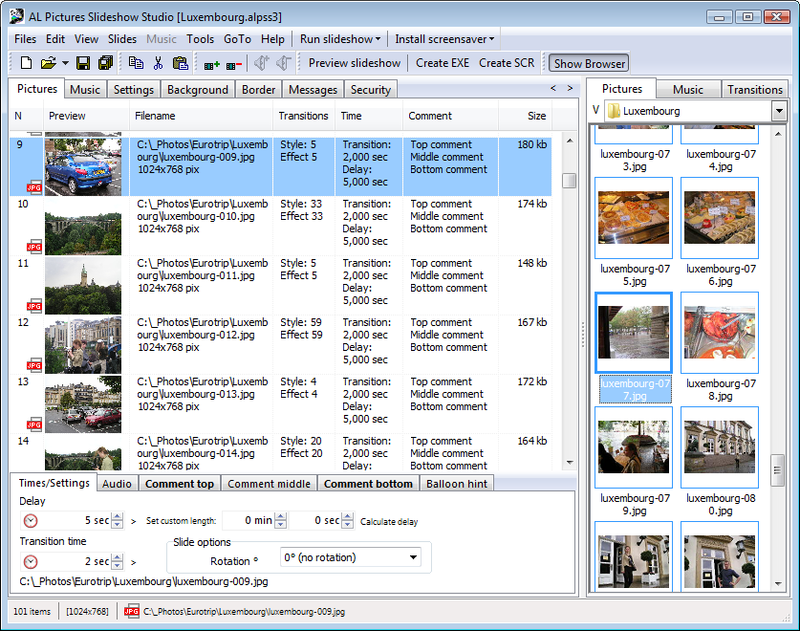 Rapidly create slideshows (EXE) and screensavers (SCR) as standalone files. ...... and MIDI formats can be used. After creating the slideshow, you can then choose what kind of executable file you wish to save it as: "MySlideshow.exe" or "MyScreensaver.scr". All projects can be saved as a work in progress, allowing you to return and create a more professional program. Separate parameters (such as background colors, audio files, comments, etc.) can be set for all pictures, groups of pictures or individual pictures. AL Pictures Slideshow Studio is very easy to use. Your screensaver and slideshow can be made with one a single touch. We recommend that you use AL Pictures Slideshow Studio for creating business presentations of products and services, family photo albums, presentations of educational materials. If you have a digital camera, astonish your friends by making a slideshow within in minutes of taking the pictures, sending it to them and then exporting the individual photos they like the most as a JPEG or BMP file. Wallpaper Slideshow is a an utility for displaying your photos on your desktop. Tool for creating wedding slideshow dvd and play on TV screen with DVD Player. The powerful Virtual DJ Studio provides you with an entire studio. Qweas is providing links to AL Pictures Slideshow Studio 5.0 as a courtesy, and makes no representations regarding AL Pictures Slideshow Studio or any other applications or any information related thereto. Any questions, complaints or claims regarding this application AL Pictures Slideshow Studio 5.0 must be directed to the appropriate software vendor. You may click the publisher link of AL Pictures Slideshow Studio on the top of this page to get more details about the vendor.